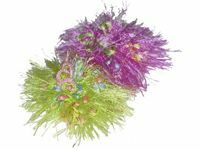 These colourful, fringed Pom Poms are lightweight and fluffy, which makes them the perfect toy to toss in the air or chase across a timber, carpeted or tiled floor. The toy is approximately 6cm (2 1/2") in diameter (including fringing). Colours are as shown but may vary slightly. Each Fringed Pom weighs approximately 20g. Price quoted is for 2-fringed Pom Poms.